Giacomo Giua is a student at Birkbeck, originally from Tuscany (Italy). He's currently studying a BA in Film and Media, trying to tackle the forthcoming academic issues from a philosophical point of view -with a mention on how these "power structure" interacts with the public domain. He's strongly grounded in philosophy -predominantly French and German schools of thought- as well as logic, technology and sociology. He was a regional and national chess player until, at the age of 15 years old, when he left the chess world and never looked back. He'll be writing about literature, cultural theory, philosophy and related topics, trying to spread different point of views. His email address is ggiua01@mail.bbk.ac.uk. Expanding on Friedrich Nietzsche’s work, Albert Camus asks what it means for man if God is dead. Firstly, we will be forced to deal with our own mortality. Secondly, if we conclude that there is a limit to life – a death with no afterlife – then we must question the meaning or purpose of life. Without the notions of immortality or a limitless life, is there any escape from absurdity? Absurdity occurs when the need for individual understanding meets the unreasonable structure of the world. Once stripped of romanticism, the world is an unsuitable place for the individual. Human thought isn’t absurd, nor is society in itself. The problem arises from the conflict between society and individual; absurdity comes out of the confrontation between these two distinct forms. From this conflict comes the idea of absurdist reasoning. There can be no place for true knowledge in the absurdity of reality, as every explanation leads to abstraction or metaphor. The concept of hope, the promise of an undefined number of “tomorrows”, is another precondition of the absurd. The eternality of “tomorrow” is a denial of the individual’s own death. To this, Camus would respond, there is but one truly serious philosophical answer and that is suicide. He does not accept physical suicide, because that would bring the absurdity to an end (the absurd cannot exist without man). The suicide Camus refers to is a philosophical one; that is, making the leap from the absurd to a higher power, be that God (Kierkegaard) or reason (Husserl). Camus sees this as both a contradiction to the original premise of absurdism and an escape from the absurd itself. In contrast, he suggests embracing the absurd. This requires an understanding of the contradiction in the human-society dichotomy; reason and its limits must be acknowledged. Passion and enjoyment of every part of the absurd life, together with revolt against the original precept, is necessary to achieve acceptance of one’s existence. Hope is also denied; metaphysical freedom can’t exist alongside hope. Camus identifies a heroic type of absurd man in the legend of Sisyphus. 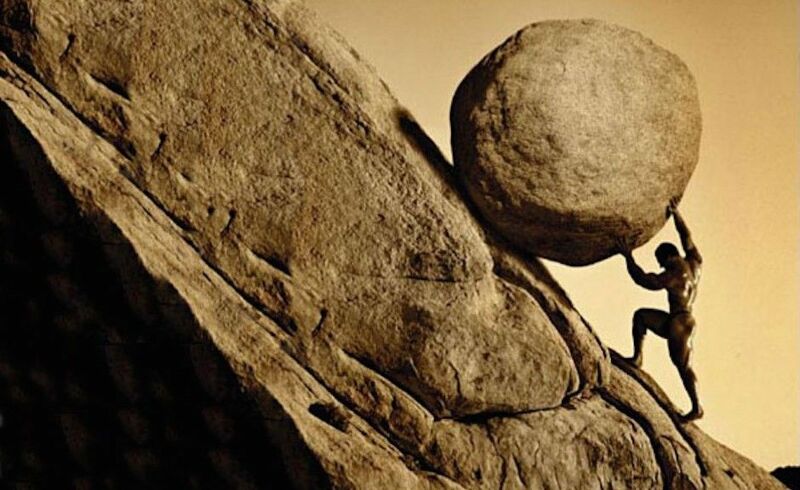 Having defied the Gods, Sisyphus is condemned to an eternal punishment: pushing a rock up a mountain, only to see it roll back down, so he must start again. The moment of tragedy, as Camus points out, is when Sisyphus walks back down to start over again; he recognises the lack of hope in his life, yet the understanding of his impaired condition gives him the freedom of acceptance. Camus compares this meaningless task to the experience of his contemporaries: “The workman of today works every day in his life at the same tasks, and this fate is no less absurd. But it is tragic only at the rare moments when it becomes conscious.” Camus thinks of Sisyphus as a happy man. Does this absurdist reasoning stand up in today’s world? Technology has become an essential part of our lives. It is embedded in the everyday. The world wide web has become an open door to the human culture through which anything can be found; knowledge can be accessed with a tap on a smartphone. This easy availability of knowledge poses an epistemological query: we perceive it as “attainable” without considering the actual limit of our intellect. A study from Yale University demonstrated that internet-based knowledge and book-based learning are completely different, with the latter performing better under testing. The same study found that those who base their knowledge solely on internet sources will boast of knowledge that they don’t actually have. As an evolved society, we shouldn’t be blind to the fact that the constant abuse of technological devices is changing the way we perceive reality. Back in the 1980s, Baudrillard recognised how human societies were transitioning into an extended reality: signs and symbols replacing our experience of reality with a construct, tailored to the human being. With this extended reality now closely aligned to advertising and stereotyped mass culture, it becomes clear that technology has become widely misused. Instead of functioning as a resource to help us compensate for our lack, it has become a vehicle for media to bombard users with messages designed to create false needs. And how could we engage in a meaningful analysis of our lives (a requirement in Camus’ absurdity of life) when the mass cultural messages that pervade our reality are telling you the exact opposite? One could conclude that these multiple media assaults might help us to recognise the absurd. But understanding the absurd is intrinsically related to solitude. We are social mammals. We nurture relationships. Fear of loneliness is hardwired in our brains, as if we wouldn’t exist without being part of a group. Through technology, the media machine has modified our perception of solitude. Fear of missing out has become a key theme of our time. This constant engagement with others denies us precious time for thinking, about our lives, our society. Without time and space to think, we can not confront the unreasonableness of society. A dilute thought is already available, just a click away. Our awareness of society has become merged with technology. There is no collision anymore, as in Camus’ conditions for the absurd to arise. Instead, the two elements collude together, forming a blend of needs and easy access that leave thinking out of the equation and makes questioning our lives feel unnecessary. Camus’ Sisyphus is a happy man, while our society is facing epidemic depression. Any thoughts why?